The last time Miami faced St. Cloud State was the first round of the NCHC Tournament, and despite being outmanned and playing on the road, the RedHawks not only took the Huskies to Game 3 but forced overtime. MU finished 1-4 vs. SCSU last season and the Huskies enter this weekend riding a six-game winning streak and No. 1 ranking. WHO: No. 1 St. Cloud State Huskies (11-1) at Miami RedHawks (9-6-1). ALL-TIME SERIES: Miami leads, 17-16-2. LAST SEASON: St. Cloud went 4-1. SCSU swept its two-game series in Oxford and won 2 of 3 in a home opening-round NCHC series. ST. CLOUD STATE RADIO: Both nights – KZRV-FM (96.7). NOTES: St. Cloud State enters this weekend as the lone unbeaten team in conference play (4-0) as well as the NCHC leader in goals, goals allowed and winning percentage. The Huskies average 4.25 goals, second-best in the NCAA, and they are tied for second in goals against average at 1.83. Senior Patrick Newell leads the team in goals (8) and points (15) as he hones in on triple digits for his career. Three Huskies are tied for second in points with 13, including Montreal draftee Ryan Poehling (3-10-13). Ryan Jackson has an identical line, and Robby Jackson is 5-8-13. A pair of standout defensemen, Jack Ahcan and Jimmy Schuldt, have 12 points each, and Blake Lizotte has 11. In net, Los Angeles draft pick Dave Hrenak has played eight games, going 7-0 with a 2.13 goals-against average despite a pedestrian .907 save percentage. Jeff Smith has excelled in relief, posting a 1.26 GAA and .948 save percentage. Miami has been limited to 12 goals in its last six games, with Josh Melnick and Karch Bachman accounting for three each. Ryan Larkin is the favorite to start both games between the pipes for the RedHawks. 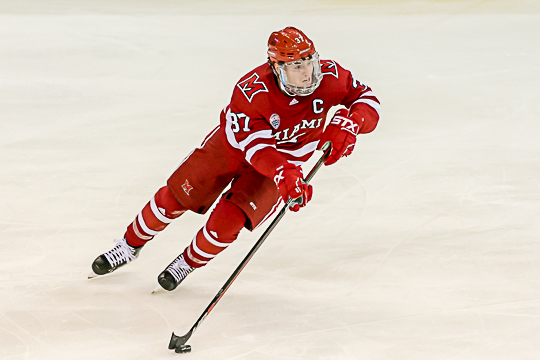 Posted on November 29, 2018, in 2018-19 and tagged 2018-19 miami redhawks, 2018-19 miami series preview, josh melnick, karch bachman, ryan larkin, St. Cloud State Huskies. Bookmark the permalink. Leave a comment.